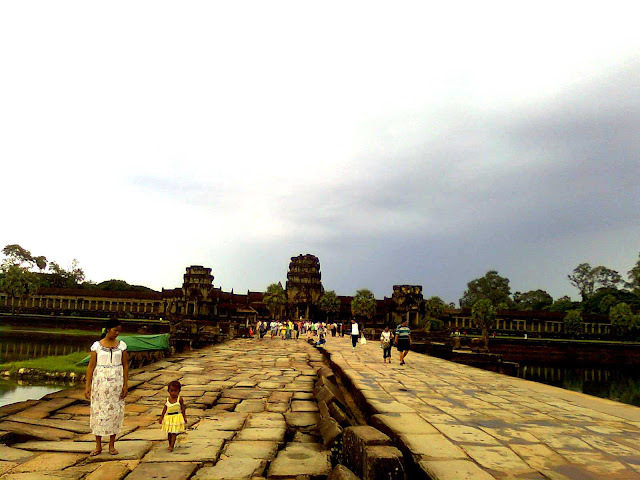 STORY: One of the reasons, if not the only reason why people go to Siem Reap, is to visit the Angkor Wat Temples. To tell you honestly, i am bad at Asian history. I didn't listen to my college professor then. I just wish i did. To tell you i have very little idea of Angkor Wat is such an understatement. But i did my research before i left, and i was told that the Angkor Wat is such a vast, huge complex with over a hundred temples littered across its vast expanse. People who go to Siem Reap book tours to the Angkor Wat Complex. It's fast and efficient, and most of the details will be arranged and finalized within your hotel or hostel. Although I don't think it's necessary to arrange a tour prior to your visit because the travel agency might charge you for a higher price. If you're considering doing it on your own, and walking at that, good luck. The Angkor Wat Complex is so huge, even with a tuk-tuk, it still takes too long. 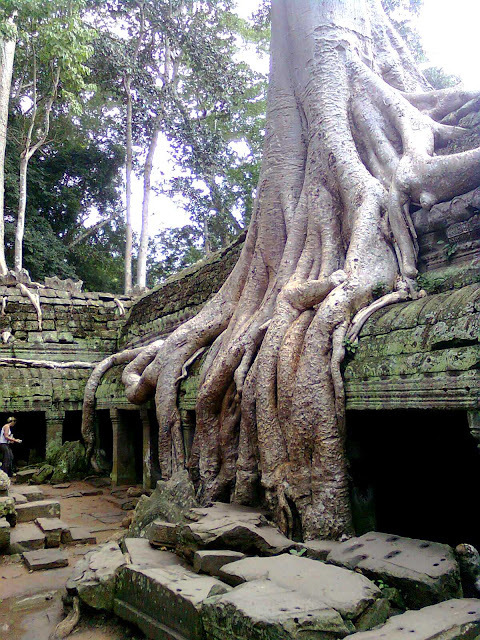 In order to help you plan out your expedition a la Lara Croft, here are 8 steps to remember so you can survive the great Angkor Wat. Step 1. Talk to the concierge at your hotel. Ask for possible tours going to Angkor Wat. You will be asked to choose one of the many options. There's a 1 day tour, there's three days, and there's a week if you are the Indiana Jones type. I chose the one day tour. You can do it the next day but be prepared with good enough sleep. Step 2. The concierge will ask you if you want a tuk-tuk driver which is really necessary since you're going from temple to temple. Minus the hassle, the tuk-tuk driver will take you to any temple you like and will wait for you once you're done. Just make sure you clear with him where he will be waiting for you or you're not going see each other anymore. Schedule for a pick-up early in the morning at your hotel. Tuk-tuks for one day tour cost about $10-15 depends on your bargaining skills. Step 3. Prepare. For someone who drank too much the night before, for someone who lacked sleep, for someone who had very little breakfast, for someone who was carrying a huge backpack, this is a nightmare for me. So, i suggest the following so you won't have the same nightmare as i had. Step 4: Get enough sleep. If you're in Siem Reap, skip a night out before you are scheduled to visit the Angkor, and save it after once you're done with Angkor Wat. You'll feel nauseous with no sleep, climbing the steep stairs, walking non-stop from temple to temple, under the heat of the sun. Everything is arranged where you're heading but still, it's not as easy as it looks like. Step 5: Wear comfortable clothing. Most people wear shirts, shorts and sandals or rubber shoes. You will surely become uncomfortable once you start sweating, so wear something light and breezy. Step 6: Carry a small backpack. Just bring the essentials. c. A face towel. Because you'll be sweating like a pig. d. Extra shirt. You might consider changing along the way, it's gonna be dripping wet. e. Sunglasses. because you're gonna be under the sun the whole time so you might as well protect your eyes. f. A camera fully charged with extra battery, if possible. I took about three hundred photos, and about a hundred on my phone because my Canon digital camera got drained just before the Angkor Wat. g. Mosquito repellent. Because once you start walking uphill and to the mountains, mosquitoes are everywhere. h. Bring candies and gum. It helps you for some easy sugar replenishment. There's a restaurant after the Elephant Terraces, if that's your route, so you can make a quick stop. You're gonna be so hungry by then. I don't know why, but they gave us discount. They might charge you a little high for a plate of rice so just ask for a lower price. You can shop also around the markets. My friend always has something bought in every stop. Step 7. On your way to the Angkor complex, there's one stop-over where you will go to pay for your ticket. Have your photo taken, and keep your ID with you all the time. For 1 day tour, it costs around $20. You will get the ID with a 1-day pass. Make a sort of itinerary. Our route to follow is Angkor Thom, Bayon, Elephant Terrace, Ta Prohm, and the mighty Angkor Wat. Go for the Angkor Wat the last as it's best seen during sunset. Really peaceful out there. Step 8. Admire at the beauty of the Angkor Wat. Its majesty. Its history. Some attempt to climb the stairs, it's closed. A guy i saw was able to do that put he paid a few dollars to the guard. And don't forget to take hundreds of photos. It's a once in a lifetime journey. Also keep in mind that rains do occur. Cambodia is a tropical country. Bring with you always the $1 plastic raincoat you can buy anywhere in Siem Reap. This is one of the most popular temples along with Angkor Wat and the Bayon because of the beautiful combination of wood and stone. Black and white film photographers especially love this site, all with Angkor's trees in the back ground. Pop culture fans, on the other hand, may recognize a few scenes from Angelina Jolie's Tomb Raider, here. While the temple is very popular, most visitors follow a central route and the sides of the complex can be surprisingly quiet. Note that large sections of the temple are unstable with rubbles and have been cordoned off, as they are in real danger to collapse anytime. And of course, the Angkor Wat. 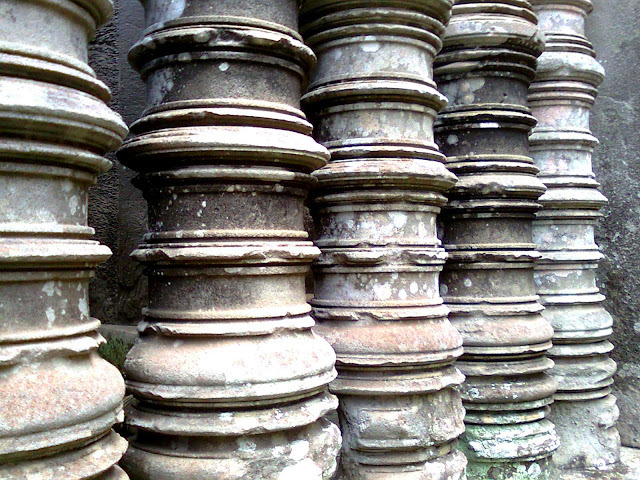 Though 'Wat' is the Khmer (Cambodian) word for temple, the westward orientation of the structure is atypical of temples. Scholars believe that the architecture and sculptures are that of a temple where Lord Vishnu was worshiped but it was also built as a mausoleum for the king after his death. So there, have a safe trip!. Enjoy as much as you can exploring the Angkor Wat. We started at 8AM and at about 12NN, i was really, really tired already. We had lunch and made a couple of breaks before we headed straight to the Angkor Wat. We roamed around the huge temple till 5PM, just in time for happy hour to celebrate. Yerp! hi Chyng thanks keep coming back. i haven't posted yet on phnom penh might help you, if you need advice or anything cambodia related or backpacking south east asia just feel free to post comment will be happy to answer back. just like to help out whatever i can. thanx God bless!!! hey... thank you for this. can you help with hostels/hotels also for a group of 8? hi anon! so you're going to Siem Reap i assume to see the Angkor Wat. I can highly recommend the hostel where i stayed in Siem Reap called "thesiemreaphostel" I review the hostel a few posts before this. Its a really good place, swimming pool, airconditioned room, friendly staff, all amenities you can use. Its about $8/night. And the room where we stayed bunk beds can fit 6 people, i think there is another room which is bigger. You can e-mail them about your plan to book a room get the bunk bed shared room. Since you're 8 you'll get the room all to yourself for cheap. I think they can even pick you up with their tuk-tuk if you tell them when and where you'll arrive. I loved that hostel so much. Next time, i'll go back there again. Hoped i was able to answer you. If you have anymore questions. Feel free to comment again! God Bless! Merry Christmas! thank you. i sure do have lots of questions. i hope you don't mind. we will have a 10-day vacation starting from bangkok. we'll stay there for 2 days, then we'll take the bus to cambodia. but we're hoping not to spend the night in pnhom penh. is the travel from bangkok to siem reap possible in one day? we're planning of renting a van for this. on our 4th day, we'll spend a one full day in angkor. i read it here that we can ask for a one day tour, so we'll take that. :) next day, we'll travel to saigon... how many hours does this take? do you know any hotel or hostel also? :) next day, is perhaps the river tour... how many hours does this tour take? is there any interesting place to see in saigon? next day (our 7th day), we'll got plane tickets from air asia to malaysia. we'll spend one night in malaysia... then take the bus to singapore, then spend another night there. next day, we'll fly back to manila. we are really in need of hotel/hostel to these places, and interesting places to go and to do for such a short time of stay in each country. usually, we spend two nights and one full day in each country. i hope you can help us... thank you. hi jopauline, looks like you're all set down the mekong country. are you excited? i think soo... i'm happy for you! wow judging from your itinerary, you're packed. but if there's a will there's a way. but just to be fair, i have a couple of friends who did the route same as yours, scam didn't happen. yes you can opt for the 1 day tour of the angkor wat its about $20/full day. Also take note to book a tuk tuk driver as the angkor complex is so huge, massive, its almost like the size of a big city. i suggest you take the tah prohm bayon first and make the angkor wat last so you can see the sunset. please charge your camera and bring extra batteries, you will for sure be taking hundreds of photos. from siem reap to saigon is about 10-12 hours depending on how fast the driver is or if there's traffic. whatever happens, you will be stopping by phnom penh to change buses going to saigon. i highly recommend taking the mekong express limousine bus if you're really not tight in budget. its worth it. as customary, you will go down on the border, show passport to immigration. don't worry asians go through it faster because the others need to pay visa fee. i highly suggest this place called Canadian hotel. its not a hostel. there's one hostel near go2bar but its always fully booked. hotels are cheap if you're sharing. i don't think they mind if more people stay. so as canadian is right in the highway so its easier to roam. but i suggest this place i forgot afew steps away from Canadian. "mula sa harapan ng canadian, meron dung daanan sa gilid. pasok ka dun parang may eskinita na papakanan tapos diretso ka lang yung tutumbukin mong hotel pasok ka dun. they are charging i think less than $15 eh four kami so imagine kung gaano kamura. im sorry i forgot pero for sure along that area puro mura na. the river tour is ok kasi i enjoyed the mekong river tour pero marami kayong dadaanan na stop over, there's one where the locals sell fresh produce, merong puwede ka lagyan ng snake sa leeg, etc. you can avail of the tour via the many travel agencies in pham ngu lao. it starts early in the morning till around 5pm. remember, the guide might suggest you take the speedboat with an extra charge. don't take it, he said it would be faster, no way, we arrived the same as the bus going back. there's a couple of tours like the underground tour where those soldier hide during the war. i didn't take it because it was so depressing. hehe.. to be honest they didn't like it so much, mas ok pa daw yung sa corregidor. there's a day tour of the city. don't take it. explore the city on your own. i suggest you walk around, going to the cathedral, temples, museums, etc. but if you're up for the nightlife go to go2bar i highly recommend the place. a little expensive for the saigon beer but the ambiance is perfect. there's a second floor where you can go dancing or if you just want to chill, sit in one of the comfy couches before night time and just watch the city go by. oh so you're going to malaysia, kuala lumpur right? since you're just here one day go to batu caves, then to the petronas. nothing much to see in the city plus drinking stops at around 11pm that's why i left the next day when i was there. i hope things change now. i stayed in haven hostel but i don't suggest it because i had a really bad case of bed bugs. the place looked nice pa naman except for that. but do get out for dinner. malaysian cuisine so far is the best in asia for me ha. everything i ate was delicious. check my blog entry on kuala lumpur. then you're going to singapore! i think you guys will be feeling a little tired by now. i stayed in the best hostel in the world called inn crowd hostel along little india its about P600/night one of the cheapest i think but renovations took place. hope you get the other wing its right in the corner a different building. or you could also stay on the next block called prince of whales that's where my new zealand friend works as a bartender i don't know if he's working as of late he just got out for the army. its about the same price. pretty cool people working there. and there's a filipino bang playing alternative and rock once a week. as usual, singapore stole most of my backpacking money. the cheapest beer you can buy is right outside inn crowd get there early afternoon where the beers are cheapest as the night progresses it gets more expensive. about P100-P150/glass. everything is expensive in singapore. but do check out the beaches of sentosa, bring your swimwear its a cool chill out beach even if the beach is fake. hehe..
pinoy boy... maraming salamat for the reply. i still have to absorb every tip that you gave me. i find it a bit amusing that you wrote as though you are traveling too! you are indeed a true backpacker! this is actually our first time... so we're all excited... but we still couldn't imagine how tiring this trip would then be, especially with the time-frame that we have. based from your post, its gona be rough and fun (i hope). btw, do we need a visa? our trip will be this august, 2010.
hi jopauline! I am pretty sure you will have the best time there! Don't forget to make friends and tell them stories how beautiful the philippines is. You don't need a visa for all the countries you're visiting so it would be so much easier for you guys when passing through immigration. i don't know but it seems they favor more asians travellin around than westerners. some westerners actually bring trouble to their country. but not all. yeah, if you still have some more questions on other countries you're visitng, i would be happy to answer your questions. again, good luck on the trip. july 2010 will be philippines time for me as i will be travellin' around Visayas for maybe two or three weeks Bacolod, Dumaguete, Siquijor and Cebu. Its about time. btw, there are tons of brochures you can get at the hostel where you're staying. Siem Reap is a really good place to shop especially the night market. you can buy all the pasalubongs there. i suggest you go buy those fisherman pants, slouchy pants. they are really nice. i regret not buying them and at very cheap too. God Bless!!! Happy New Year!!! really? im from cebu! maybe i can help you with your trip. that's really good to hear that i was able to help even in my own little way. yes i will be spending maybe a week in cebu where i will go the last before i fly back to manila. i have plans of visiting bantayan island, as well as olango, and of course check out the city. 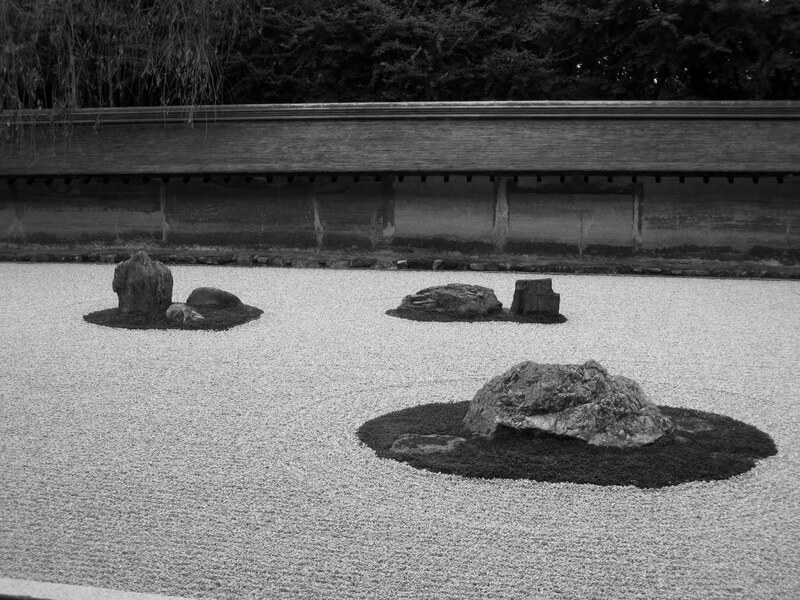 but that's about it so far, i want to go to many places where tourists don't usually go. do you have a website or where i can contact you before my trip in july. if i find it really nice, i may just have to rebook my flight and stay in cebu for some more weeks. hehe..
happy new year to you jopauline and the rest of the cebuanos! how many days do you intend to stay in cebu? if you want to visit Olanggo, try Island Hopping instead. You can visit Olanggo, Pandanon Island and Hilutungan Island in one day. Pandanon is exquisitely lovely. you shouldn't miss it. i heard that the admission fee in Pandanon is 150% more than before. it used to be only 50PHP... The island hopping btw is 2,000-2,500 per boat, and choose the port beside Portofino Beach. Since your around this area (Mactan), make a quick stop to Plantation Bay Hotel. Just tell them that you're inquiring for rates, and if they're not too busy, they can give you a free tour! The staff is really friendly, and Plantation Bay has that serene feeling. I love the waters underneath the villa... makes me feel like Brooke Shields in Blue Lagoon... hahahah! Anyways... Bantayan Island. I was there when i was 13... I remember we stayed at Ogtong Cave. I even swam in the cave that smelled like bats. We also rented a motorcycle, and drove around town. I like the provincial atmosphere... Its best to go there during the Holy Week. If you want to travel around the city, do go to Colon! just be aware that "Snatchers" are just around corner, or could even bebeside you. i suggest, dress yourself as "taong grasa" na lang... kidding! its not really that bad. just like manila, you just have to be extra careful in certain places, and as much possible, don't bring your cellphone or any of your valuable. If you have time, go down south... visit the towns like San Fernando, Car-Car, Oslob, Badian... In San Fernando, there is a church called "Simala"... This church is truly miraculous. In fact, I used to go there every major exams when i was still in college. hahahah! In Car-Car, you can eat the best chicharon in the world and see the biggest shoe! In Oslob, there is this island called "Sumilon Bluewater". Its a 30 min boat ride away from Oslob. In Badian, they have "Kawasan Falls" to boast for. The churches in this side of the province are really really ancient. Perfect for photographers! How to get there? Just ride the Ceres Bus, or a V-Hire. Nightlife? Simple, go to Junquera. hahahah! Really, Cebu is this city that has everything in it... and everything is 20 minutes away! You should live there! I am not currently in Cebu btw, but i'll be back in April. wow thanks so much jopauline. now i am really excited to go to cebu. i think i will extend for sure. this is my last stop before going back to manila and i intend to stay very long in visayas. thank you so much for the tips/recommendations. it felt like i already know where to go. i couldn't thank you enough for the advice. daghang salamat! happy new year din!!! hi jopauline, no problem. yes mekong express limousine bus is a direct bus, that is also one of the great reasons why i highly recommend it as compared to the other bus companies. also, unlike other buses who stop by at some areas to get more passengers, i didn't experience it in mekong express. plus there's a toilet inside so its more comfortable, and the best part is not too many people ride it because its one of the more expensive buses because its vip. but its not too much, i mean, its well worth it for the kind of service it brings. trust me. when are you leaving? it seems you're pretty dead set on cambodia! august... we're aiming to bring peace and love in bangkok and cambodia. hahahah! btw, how much did you pay for the express bus? nice! actually don't worry about protests and rallies in bangkok, they love travelers all year round. i think when converted to peso, maybe not more than P1200 or maybe even less. for about a few hundred pesos you get a vip treatment. also when crossing border between saigon and phnom penh, the bus will wait for you plus the driver/guide will get your passports and its faster since he gives it direct to the immigration. hassle free talaga! Hey Lovely, that's great news! how was your trip? did you guys have fun? Saw your blog and looks like you had such great time! Will read it now, had free time at the office! he he Cheers! Hi Jerik! Thanks for this post! Will read it again right before my trip to Vietnam and Cambodia in 11 months. Haha! Layo pa but I'm just so excited for it that I'm reading na guidebooks and so many blog entries on it. Also planning to take just a one-day pass to the temples since there just seems to be so much travel time (bus from Saigon to Phnom Penh to Siem Reap:) involved and so many things to see in between. @slouchingsomewhere i am excited for you. you will love Cambodia and Vietnam. Yes, feel free to read also my Vietnam "Saigon" entries. I hope i can help you out with your itinerary. If you have questions, just make a comment, would love to help out! This is very helpful! Me and my husband are planning for a Saigon-Siem Reap-Bangkok trip. I'm currently obsessing about the budget! Now I know that we only need to spend one night at Siem Reap. :) Maybe we can squeeze in a quick Phnom Penh! 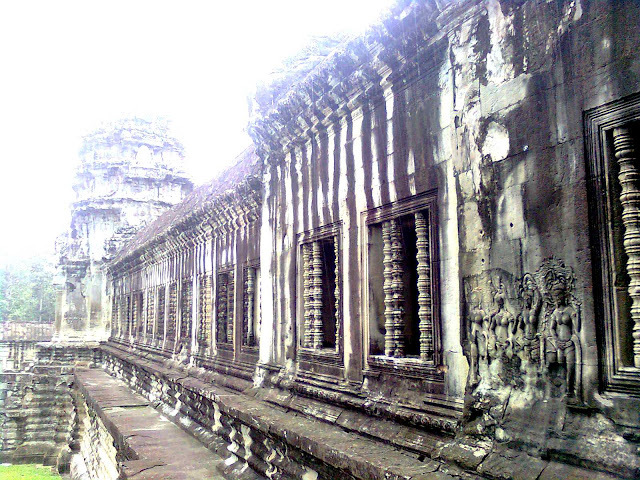 @km_02 Yes Angkor Wat for 1 day is enough unless you want to really explore the other temples and you love archaeology. Otherwise, a quick trip to Siem Reap could suffice. I love Phnom Penh and its charm. I think if you want to really get to know Cambodia on a more personal level, head to Phnom Penh! If you have other questions, let me know. Would love to help out. Hope you and your husband will enjoy your trip!